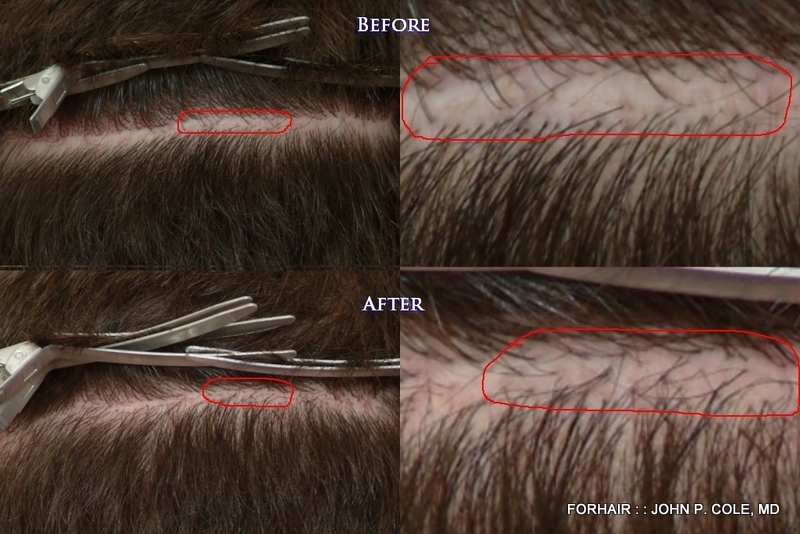 Below are before and after photo comparisons that depict a four month result of 75 CIT grafts into a linear scar produced by strip hair transplant method (FUT). The scar was approximately 13 centimeters in length and 4 millimeters in width. Prior to coming to our clinic, this patient went to a well-known clinic to add density to the front. The result of the strip did not meet the patient’s expectations so additional grafting and scar grafting was the next goal. 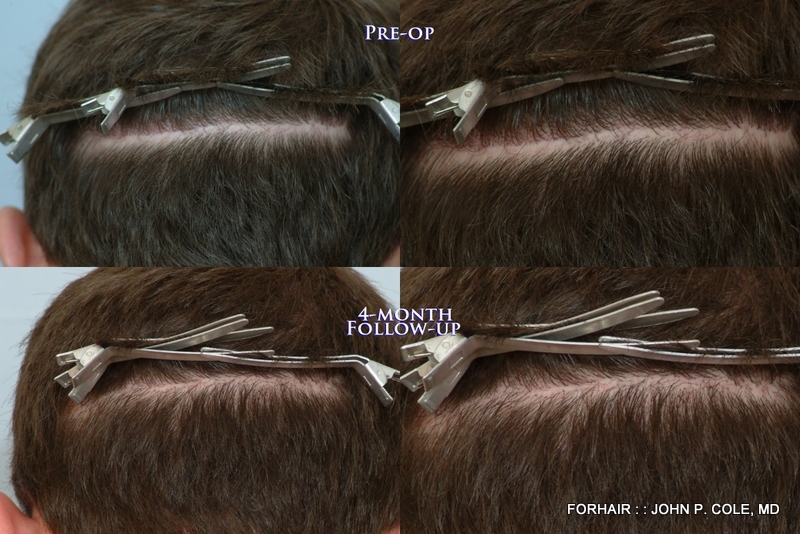 Many patients who proceed with strip are told that the linear scar will heal pencil thin or that the linear scar will not be visible unless they cut their hair extremely short in that area. The fact of the matter is that some patients heal well and some heal poorly regardless of the strip surgeon’s skill. Some patients are also told that scar revisions are the best way to resolve the appearance of strip scars. 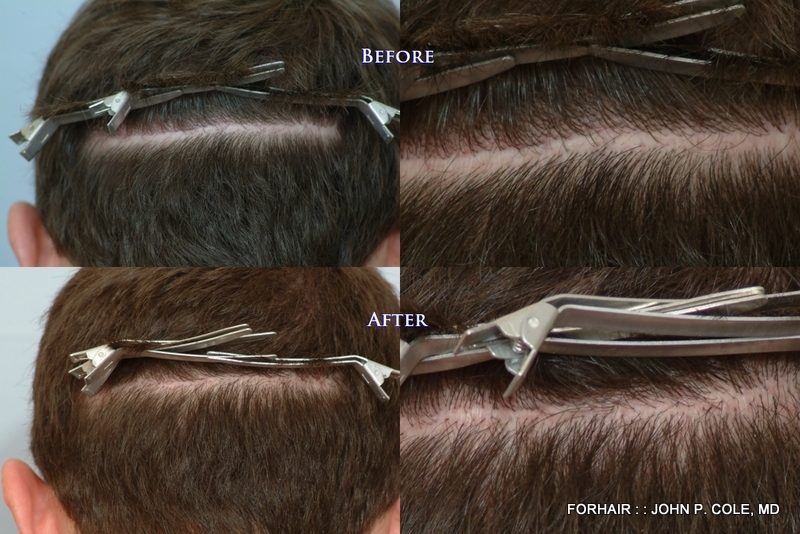 Scar revisions can be helpful in some isolated applications, but can also cause conditions to worsen by creating more stress on the scalp that can result in an even wider scar in the end. Strip scars are unpredictable due to a lack of blood supply. We prefer to graft strip scars and treat them over more than one session. This small procedure is very effective in eliminating strip scars. Scar repair is a very common procedure at our clinic. 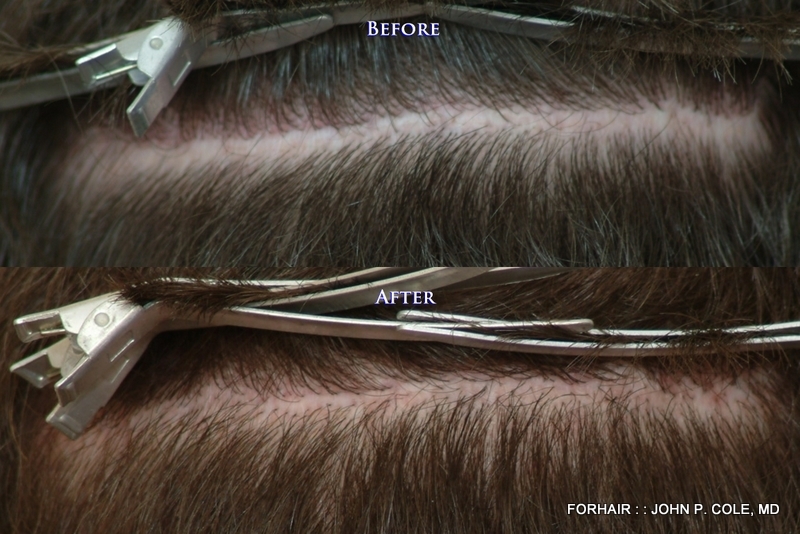 In this case, Dr. Cole transplanted a small number of grafts into the scar for a significant change. At 4 months post-op, the newly transplanted follicles are just beginning to return into the active growing (anagen) phase. We can definitely expect much more growth in the next couple of months. why bothered with only 75 grafts? 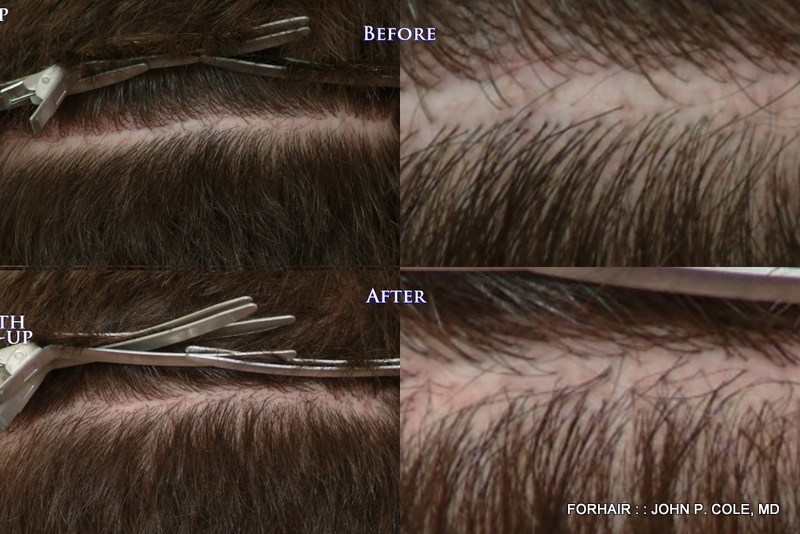 » why bothered with only 75 grafts? Well I see the difference… and I’m sure the patient is happy. I’m assuming CIT is FUE? » » why bothered with only 75 grafts? » assuming CIT is FUE? I can see the difference too but really the original scar wasn’t bad at all IMO. How come Dr. Cole doesn’t seem to like the idea of using beard hairs? This guy would be a perfect candidate for grafting beard hairs into strip scar. Recently, this lucky patient decided to stop in for a check-up and friendly conversation. In a short time, it was evident that this patient had already become more confident with the appearance of the scar. This result is phenomenal considering only 75 grafts were transplanted. There is definitely an aesthetic improvement in the appearance of the scar. Better yet, the fact that this particular case shows results at four months is very positive. Scar grafting results are not guaranteed regardless of the donor resources and that is just one of the risks from having strip surgery. 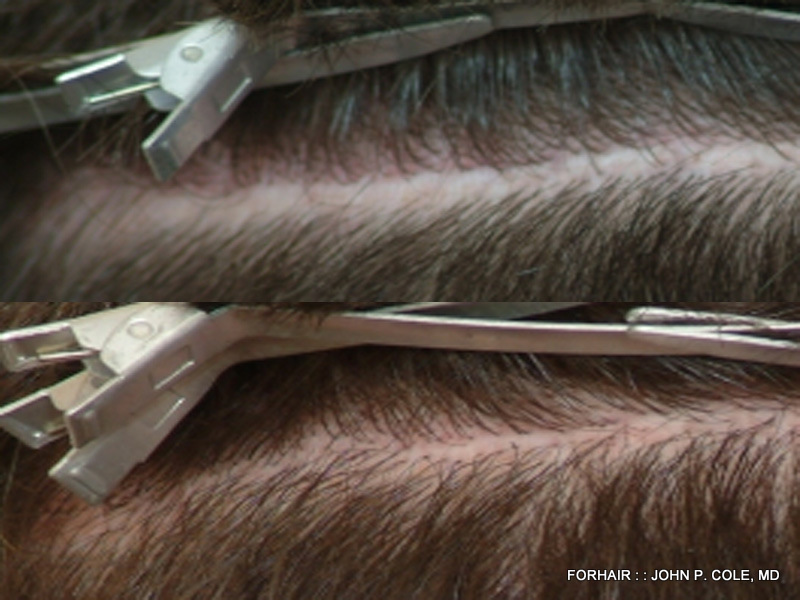 Donor scalp hair is superior to any donor body hair and is more than likely to benefit the patient. Beard donor hair remains subject to the same common limitations of all body hair and is less predictable than scalp hair. Some patients just aren’t made aware that strip method procedures will result in a linear scar. We have come across some patients who have no idea that there is a linear scar, but then there are patients who wear hats every single second of the day. At the end of the day, what matters is that the patient is happy and that is reason enough to transplant only 75 grafts.